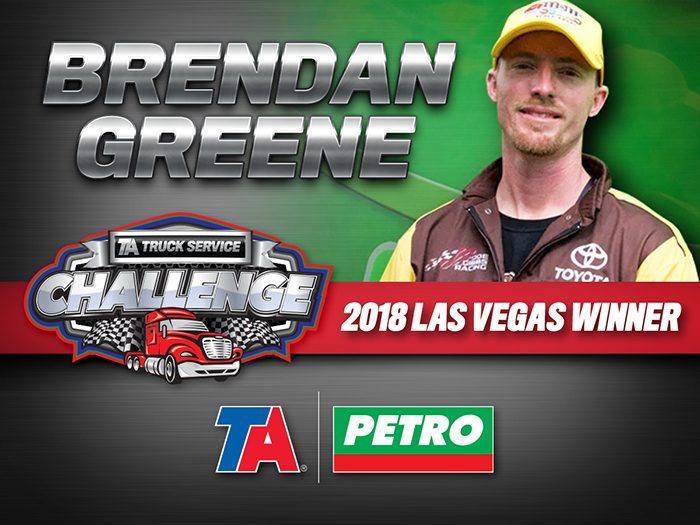 Congratulations to Brendan Greene, aka “Slim”, of the Joe Gibbs Racing team who won his second TA Truck Service Challenge of the 2018 season on Sept. 13 at the Las Vegas Speedway. 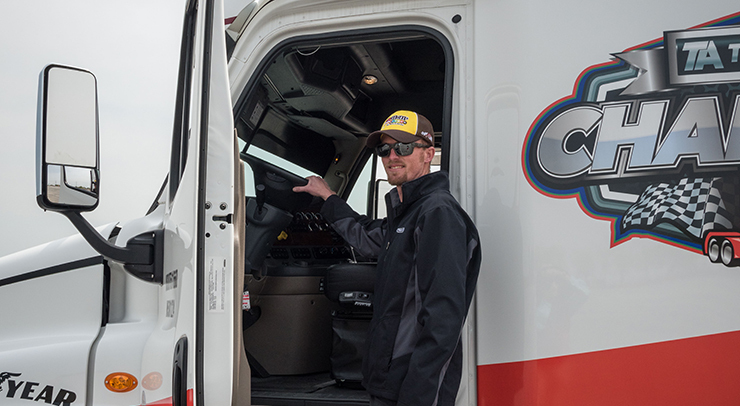 The 2018 TA Truck Service Challenge circuit is coming to a close, but Brendan Greene is just getting started. His competition may need to keep an eye out for this two-time winner if they want to keep up with him in the Charlotte competition. Back in March after his first win in Atlanta, Greene told us he didn’t plan on stopping there, and he kept to his promise. “I study the DOT book the week before these events in the hopes I can do well on the written test section of the competition,” Greene said. It’s safe to say his studying technique is paying off. Despite the small infraction he received on the obstacle course, Greene received a perfect score on the written test, and he’s carrying that momentum with him going into the final race of the year on Sept. 27 at the Charlotte Motor Speedway. After Greene’s Atlanta win, he put his earnings toward a new dollhouse for his daughters, but because of Hurricane Florence, this win was a little different. His wins certainly mean a lot to his family, but Greene also described how much it would mean to the Joe Gibbs Racing family. Greene continued by showing his gratitude for TA Truck Service, the event sponsor. We appreciate Greene’s gratitude and are proud to sponsor an event that celebrates the hard work, professionalism and friendly competition amongst NASCAR hauler drivers. Come support Brendan Greene and his fellow competitors at the last event of the year on Sept. 27 at the Charlotte Motor Speedway! Learn more about the gentleman of the Joe Gibbs Racing team who swept the 2018 Challenge podium.